Mandy's Russian Dress is done. The back is the same as the green one. Now I've started one in blue for Vroni. 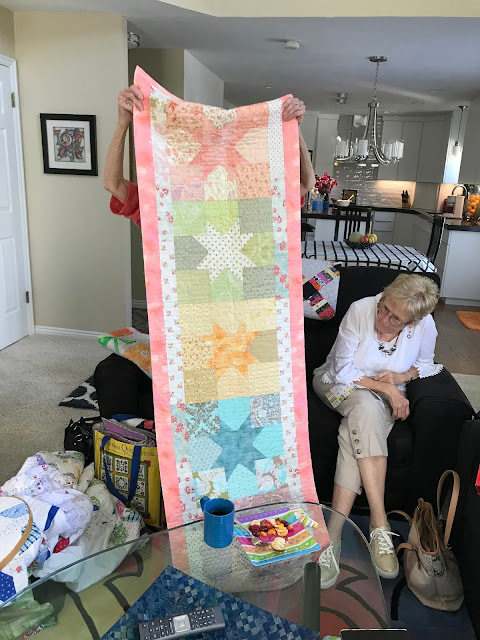 Vintage Stitchers met at Marilyn's, so I'm showing off some of her quilts. Marilyn loves bright, primary colors. Visiting her house is like walking across a sheet of paper with well-ordered crayons posing artistically here and there. She gave us a tour of her new master bath. 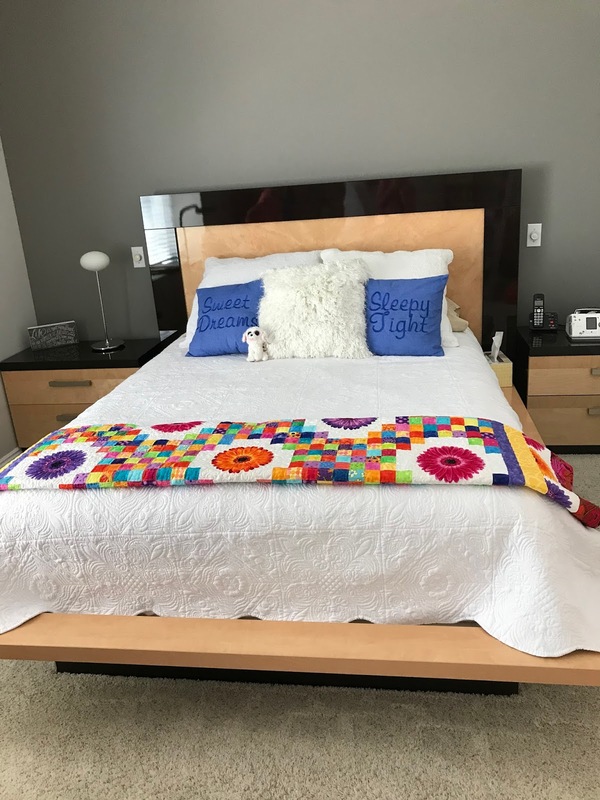 It's beautiful, but I couldn't get enough of all the lovely quilts used in decorating her home. This one used fussy-cut zinnias on a white background for the "plain" blocks in an Irish Chain pattern. Here's a look at the border. The same fabric line, but with different backgrounds were used in this Bear Paw variation. The bedroom had other lovely quilts on a ladder against the wall, something I would like to do after we move. The Vintage Stitchers had some great show-and-tell for us. 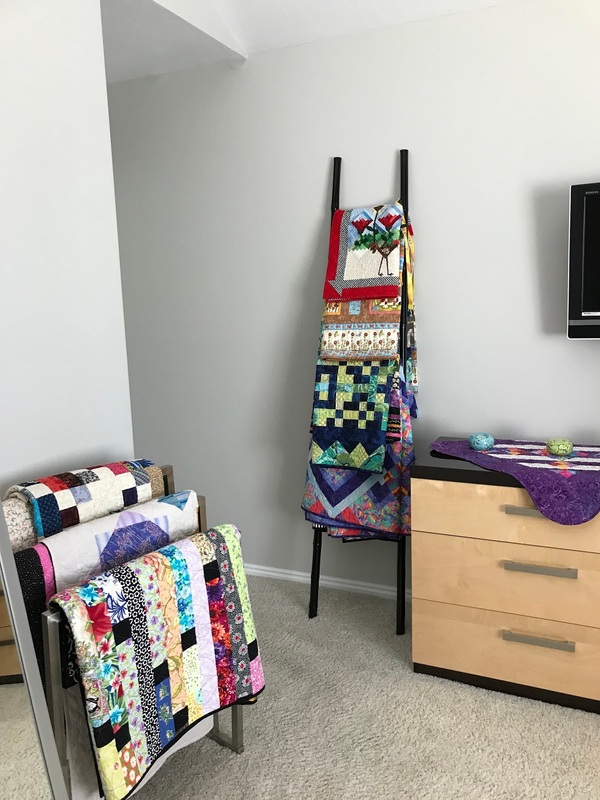 Carol had made a couple of chair covers, basically quilts made as wide as her chairs, so they could protect the chairs without being folded. As I said, there were two. 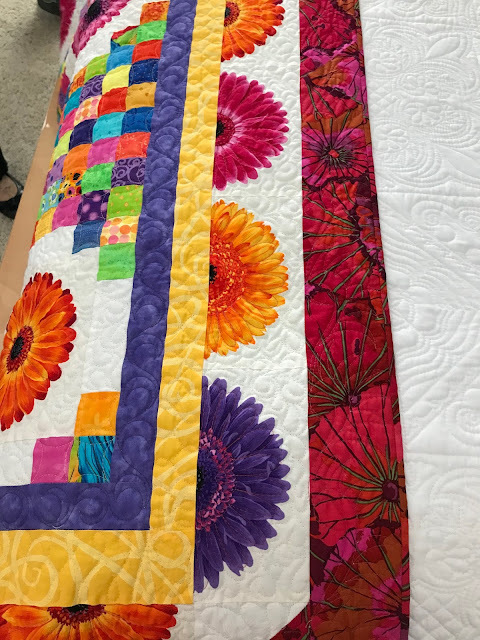 Several of our members have made the Goodnight, Irene quilt. This is Barbara's. 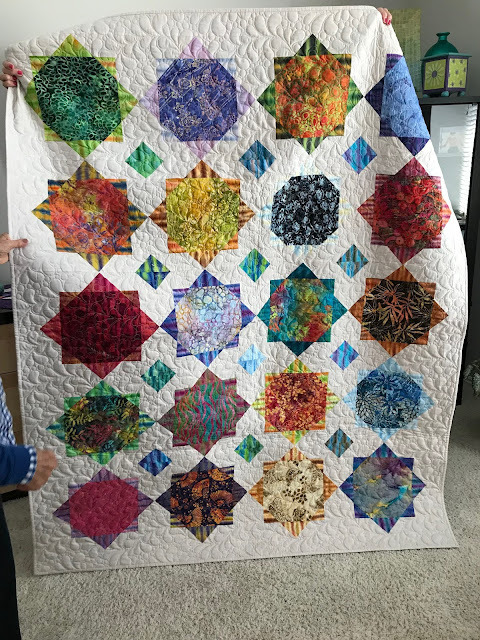 She used a pretty batik for the border. 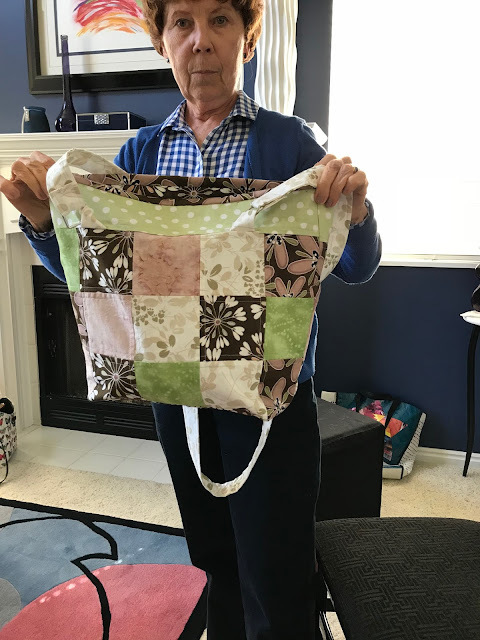 Diane had been making some bags. She's an avid knitter, and a knitter can never have too many bags. We had a nice visit, and chatted about how our group got started, back in 2004. Another quilter had been working on an appliqué quilt, a BOM (block of the month) at a local quilt shop. It was such a lot of hand appliqué that she decided she wanted to hand-quilt it, so she recruited me to teach her. 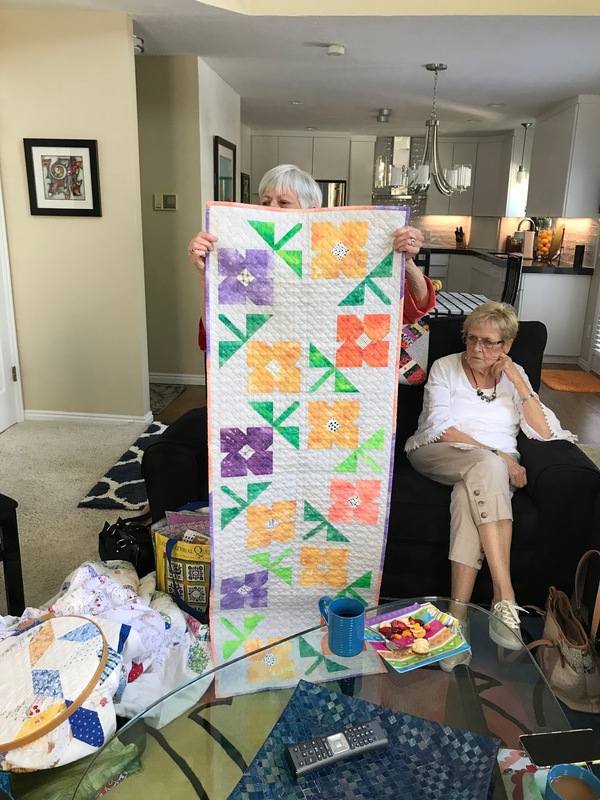 We had met at her quilt guild when I gave a talk about how to make quilts like the ones that are now considered antique. 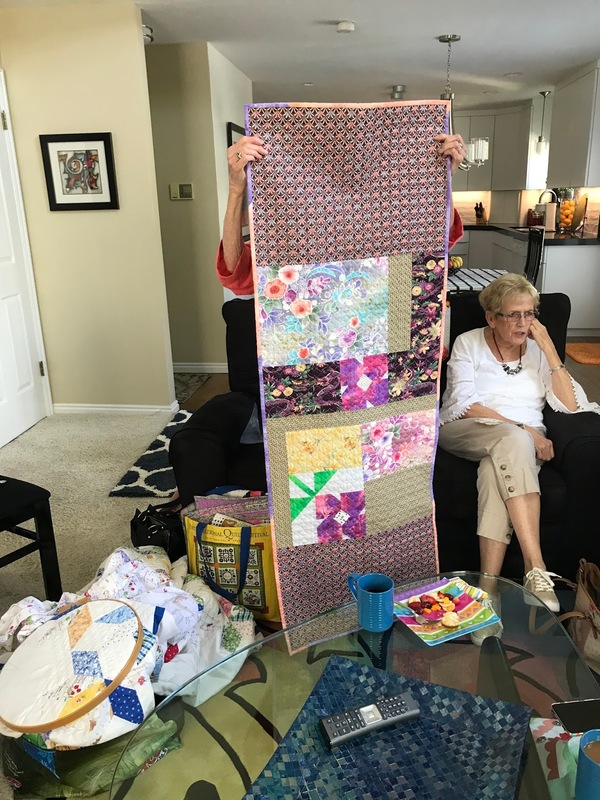 She came to my house for a few lessons, and we decided it would be nice to have a mini group centered around hand work (quilting, appliqué, sewing on binding, etc.). 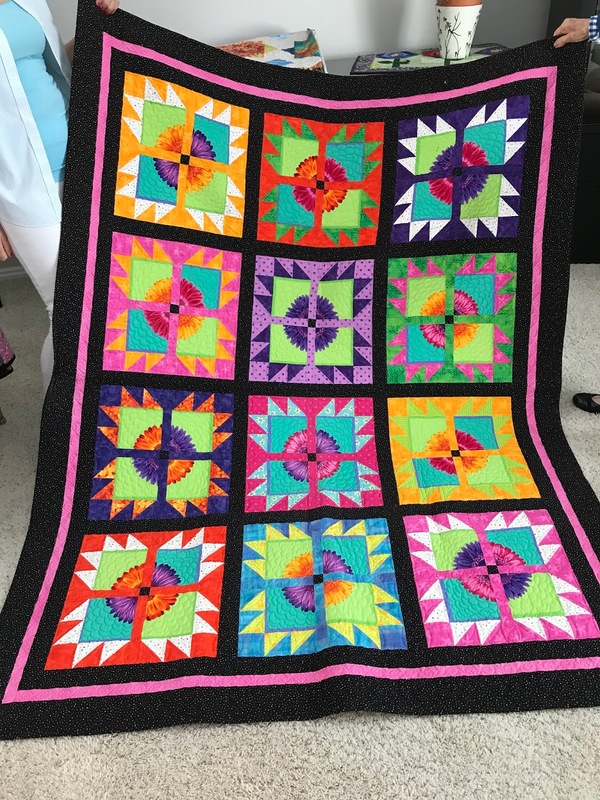 I ran into Barbara and Carol at the Utah Quilt Guild's Quilt Festival that year. They had been at a meeting I attended where I mentioned the group. We were in a booth in the vendors' mall, and we started chatting. They invited a few friends to our first meeting and I invited a few. Several of the original members have moved away (as I will be doing soon), and we've added people. I'm hoping some of them can come to my new place in 2019 for the Sisters Quilt Show/Festival put on by the Stitchin' Post in Sisters. Spring has finally arrived. I heard my first hummingbird this morning. About 10 years ago, I planted these bulbs (I don't know what they're called) under the big tree in the front of the house. That spring they came up across the street. on the slope that leads up to another home. Some of our 4-legged gardeners thought they would be more visible there. They get more morning sun, too. Something is sprouting up in our driveway, though. 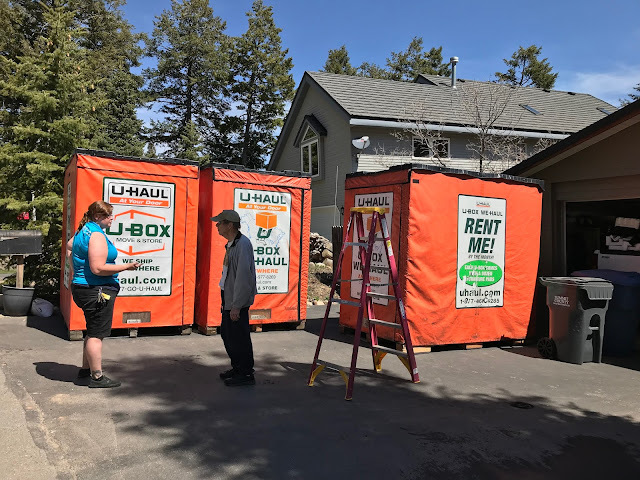 U-haul boxes. They're pods for moving. You fill them up, and when you're ready, they come and pick them up. They will haul these to Bend to put into storage for us. When we're ready to move into a new home, they will deliver them to us. Saturday we went to the Utah Democratic State Convention in Salt Lake City. 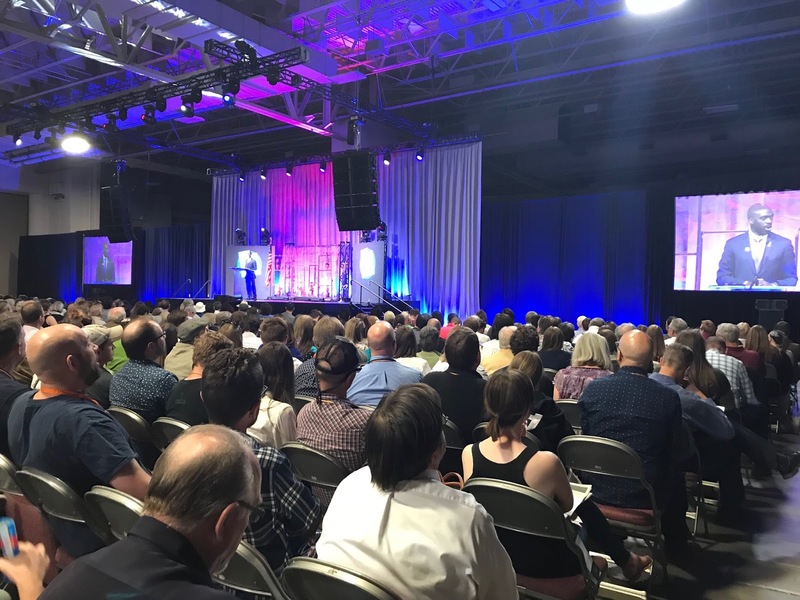 There was a lot of discussion, some inspiring speeches and votes for candidates for various offices. We had one race that will require a primary, but the others were decided right there. You can't see me, but I'm right down in front, right in front of the podium. What I found stunning was, one candidate decided that another candidate running for the same office was a better choice, so he threw his support to her. There were five candidates for that race, and she won. It will be an uphill battle for all the candidates in November, though. Utah is reliably red. I sat next to a lady who was crocheting dish clothes. I was working on my Coastal Skies shawl. She said she didn't know how to knit. 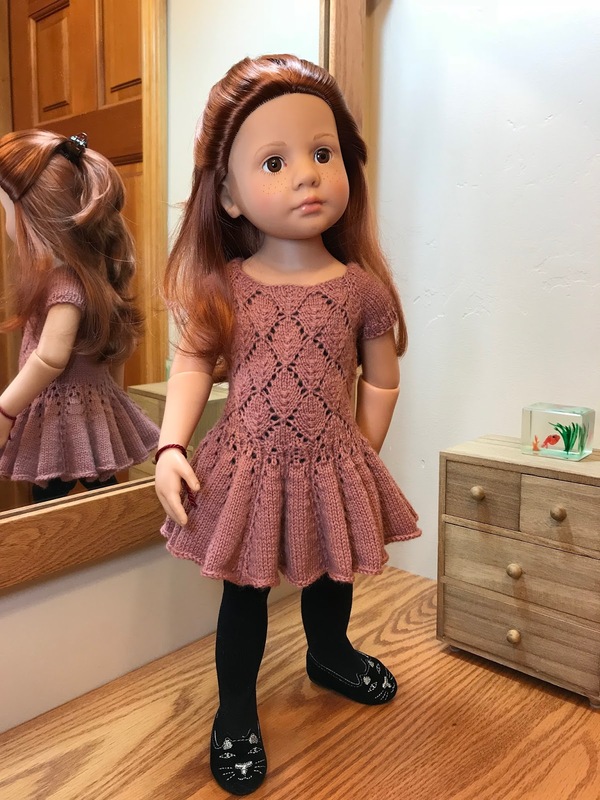 I saw she was holding her yarn the way I do for Continental-style knitting. I've seen people hold the right needle the way she held her crochet hook. I demonstrated for her how she could knit using the same skills she already knew. I think I may have a convert. What's on my needles: Still the Coastal Skies, a little more progress made, and the third Russian Dress. What's on my Featherweight: Put away in its case until I get more packing done. 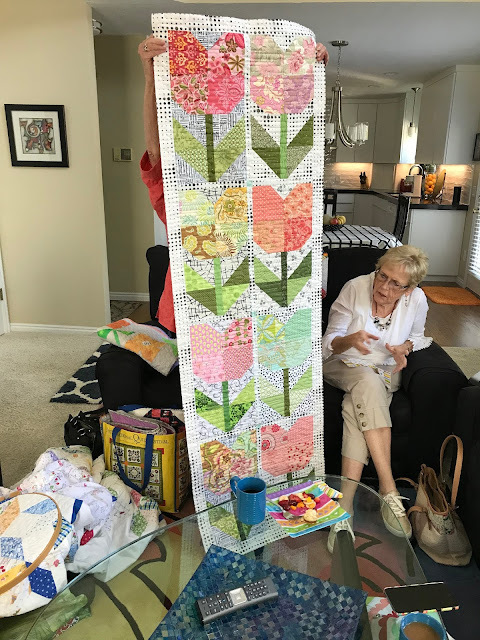 What's in my hoop: Still the Spring Flowers quilt, but a lot of progress made this week. What's on my iPad/iPhone: Finished A Higher Loyalty by Jim Comey. It reads like a good novel, but it also made sense out of a lot of recent history and rang true. Now listening to The Miser of Mayfair by M. C. Beaton. Just getting into it. What's in my wine glass: Charles Shaw “Two-buck Chuck” Shiraz. DH was busy when it was time for my wine break, so he said just to get one of these. I’m glad that soon I’ll be living where I can buy this very drinkable wine in my local Trader Joe’s, instead of having to smuggle in a supply from out-of-state. 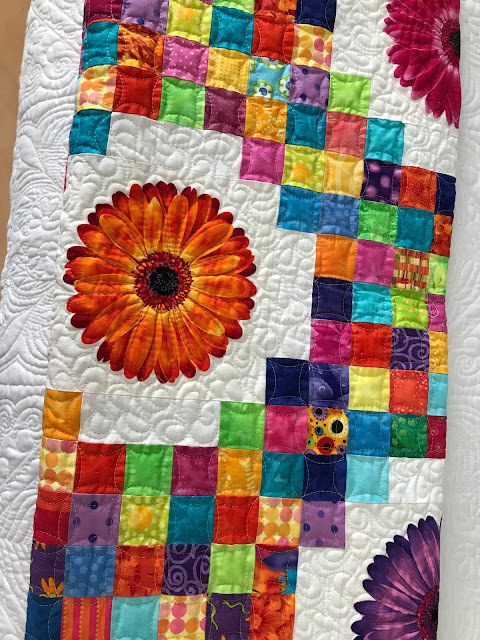 Today's favorite is the zinnia quilt. When I was a girl, I didn't like zinnias but my mom explained that they were hardy and could live anywhere. Now I understand and have come to love zinnias. Sounds good. I send out an email at the beginning of the week we meet asking for a host if we don’t have one. Someone else will take over for me when I leave. The host has coffee and something to eat. 3 of us are going to continue to get together monthly even if the group disbands. I was already friends with them & met the others through them. 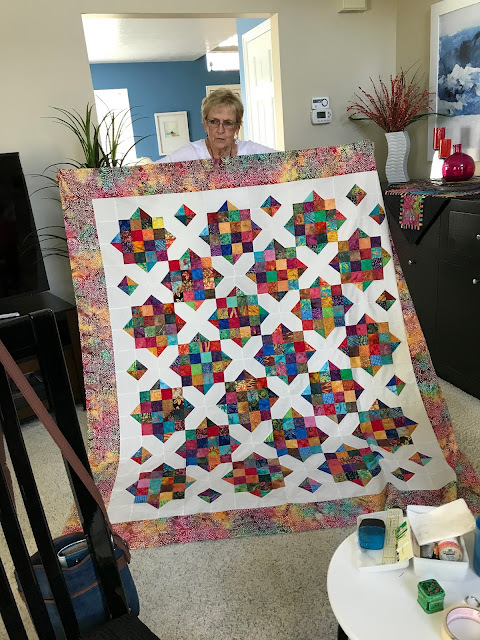 They are all longarm quilters & had met through a longarm quilting guild. One of them is going to host a meeting at her house at the end of this month & we hope that will tell us if the group will be able to continue. Janet, I hope you can find another group. I think it’s important to have friends with similar interests. 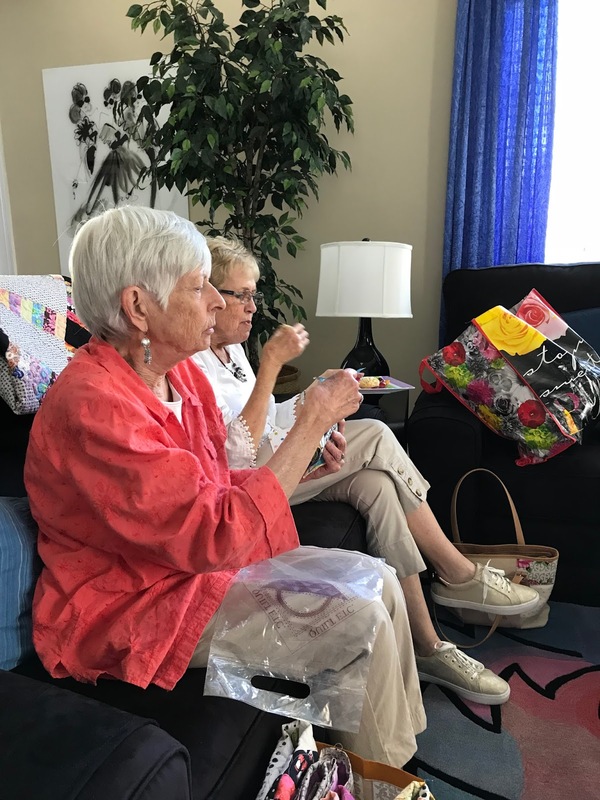 Peggy, I enjoyed reading about how your group got started. I have been in a couple that were like that. Sadly, it appears that my latest little group that was formed in 2017 is going by the wayside. I would drive 68 miles one way to attend as I considered it to be the highlight of my month. We all had the same political viewpoints (same as yours) which is as hard to find here in MO as it is in UT! I really enjoy seeing your show & tell. Pam, they are. Everyone in Vintage Stitchers is talented. It was so nice to see Marilyn’s other quilts. Wonderful blog post Peggy. Marilyn's quilts are so cheerful - I love her colour choices. I have those little flowers in my garden too - and like you, I don't know what they're called. I consider them to be a wild flower as they are often found in the woods near our home. They are the first thing to bloom in our garden and when they come out I know that spring has finally arrived! My little crop of them are the result of transplanting from a gravel pile along the road into our property. 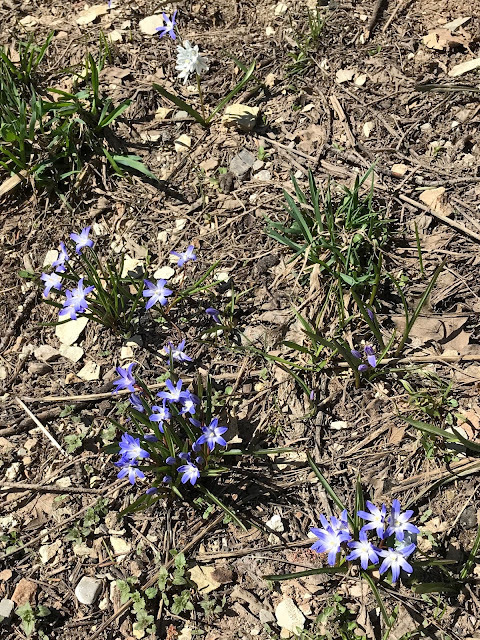 Normally I would leave them where they grow - I don't like to disturb wild flowers, but these were in danger of being plowed under so I rescued them.